Listen in amazement as music syncs with dazzling action in this pulse-pumping, high-speed shooting game! In addition to the current 2 modes, a hidden AWAKEN MODE has been added! In addition to the current 2 modes, a hidden AWAKEN MODE has been added! Use your awakened might to evade over 10 times the normal onslaught of enemy fire! 2 exciting new music tracks have also been added! Move your ship by dragging your finger across screen to avoid red lasers and destroy your enemies! Enemy lasers are slowed by the anti-gravity field that automatically expands around your ship. If you're not crazy about facing a laserstorm head on, you can take your time by catching and dodging them with the field. The more enemy lasers there are in the anti-gravity field that surrounds your ship, the more "energy bits" will appear when you destroy an enemy. Collect these to increase your score. In addition, each time you collect an energy bit, the Energy Gauge at the top of the screen will increase. When it fills up completely, you will enter Awakened Mode, where the screen lights up in a dazzling light show. You will be completely invincible and have maximum weapon power until the gauge reaches zero. Also, destroying enemies in Awakened Mode will release large amounts of energy bits! If you find yourself surrounded, shake your device rapidly (*1) to discharge your anti-gravity field on the entire screen. But use this with caution: you will lose your anti-gravity field for a short time after using it, making it impossible to slow down enemy lasers. *1 Can be set to activate by simply touching the screen with 2 fingers (via Options). The main Techno Trancer mode. Novices and experts alike can enjoy the quest for 100 Phases and 10 million points! Aim for a high score within a 60 second time limit. Awakening adds to the clock. Face a hail of lasers in this hard mode. Skilled pilots are given the choice to awaken, or die! - The only things that you cannot touch are the red enemy lasers. You can touch enemy ships without taking damage. - Enemy lasers need to touch your ship's core to damage it, so you can get very close to them and still remain safe. 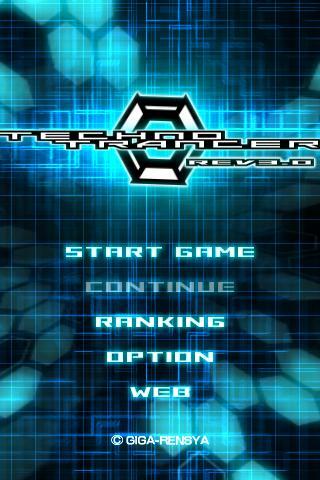 - Avoiding enemy lasers is easiest if you move slowly and smoothly. If it looks like you're going to get surrounded, try to weave your way in between the enemy lasers to escape. - If you think your ship moves too slowly or too quickly, adjust the speed in the Options menu.